Raita is something I make often to accompany curries and pulao. Making raita as part of our daily meal is a good way to include curd. Curd helps in soothing the stomach after eating spicy food. And raita is a delightful way to have curd if you do not like eating plain curd like me! I often make a simple onion-tomato raita to go along with my curries and pulao. 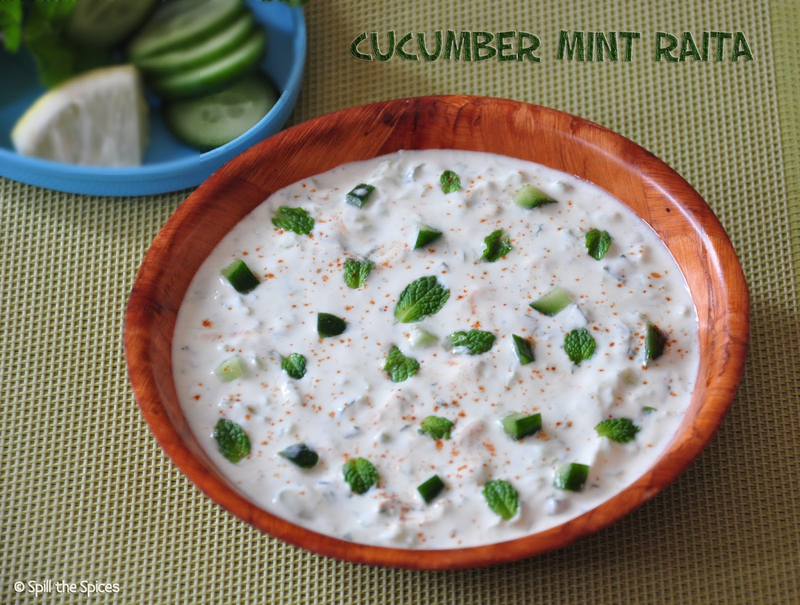 For a change, I made this mint flavored cucumber raita. The mint flavor is not so over powering and lends a fresh aroma to the raita. The raita tastes best when chilled and served. Greek yogurt works best for this raita, though you may use normal yogurt too. 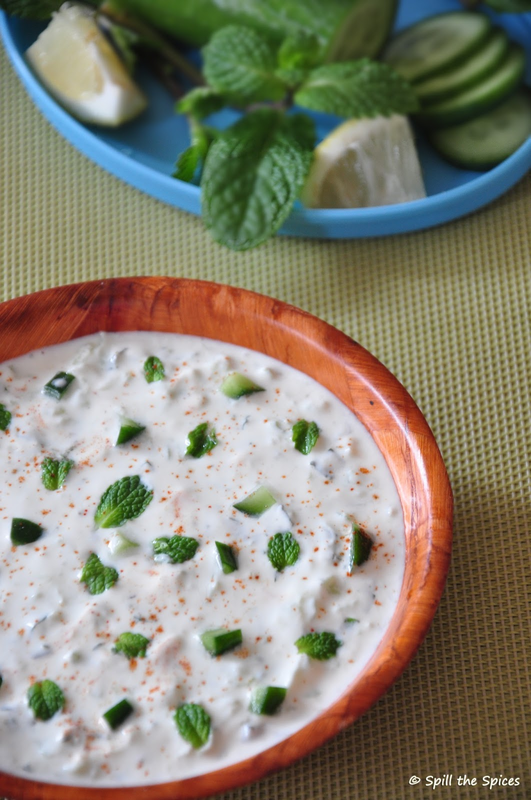 Relish this raita with curries, pulao, biriyani and even as a dip. 1. Dry roast the cumin and pepper. Powder them using a mortar and pestle. 2. Peel the skin of cucumber and remove the seeds. Grate the cucumber and squeeze out any excess water. Keep aside. 3. In a bowl add curd and whisk well. Add salt, cumin-pepper powder and mix well. Add the grated cucumber, mint leaves and mix well. 4. Refrigerate for 20 minutes. Add lemon juice just before serving. 1. You can use normal yogurt instead of Greek yogurt. Make sure the yogurt is thick. 2. You can add finely chopped green chillies for some spice. Wow ! Who will say NO this raitha... Fab decor ! love to make biryani to eat this yummy raita with. Raita looks so refreshing and yummy !!! I make this all the time actually it tastes better than our usual ones when served with meat dishes. That is delicious yummy raita, love this . I haven't tried anything cucumber for long time. 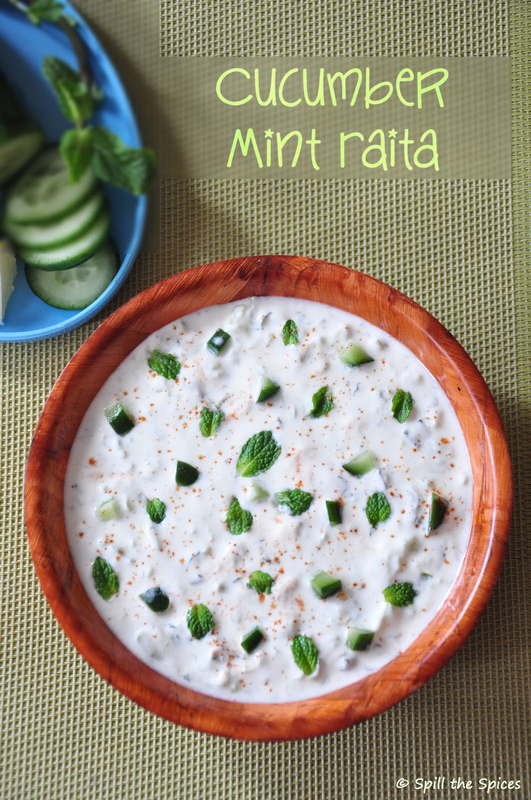 This is just the most refreshing raita ever! Lovely pics, raita looks so refreshing and delicious. Refreshing and healthy raita, perfect with biriyani and pulao.